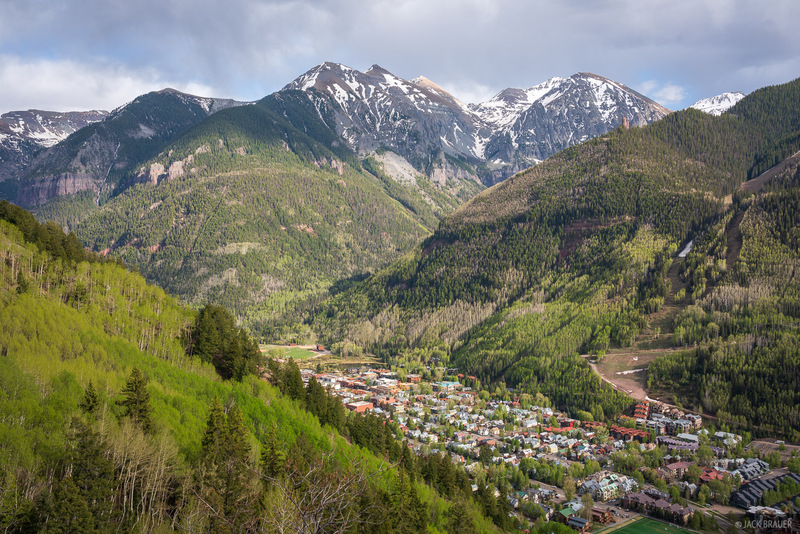 The towns of Ouray and Telluride in the San Juan Mountains of Colorado are only 10 miles apart as the crow flies, but are separated by the rugged Sneffels Range. 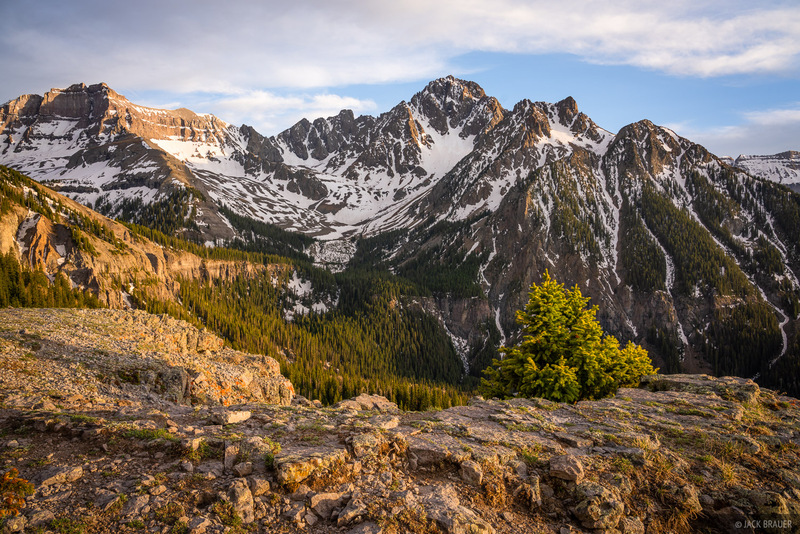 In the summertime it's possible to hike, run, bike, or even drive 17 miles over 13,114 ft. Imogene Pass between the two towns, but in the spring this route is still covered in snow - even after a low snow season like this last winter. 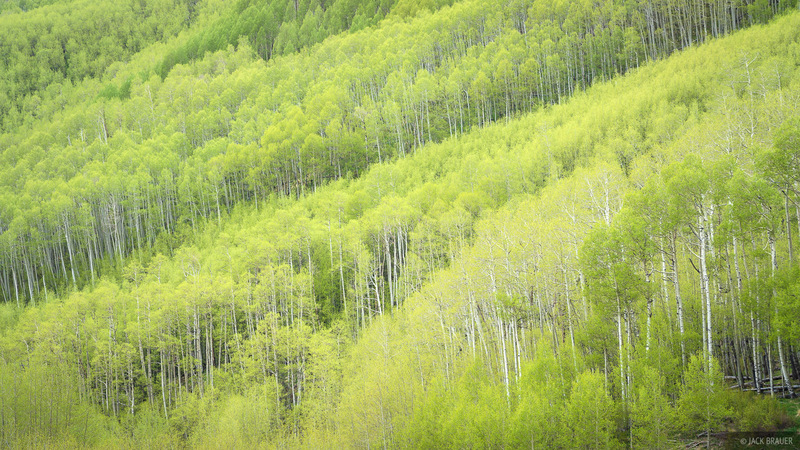 With a disturbing 20% of average winter snowpack in the San Juans this year, the trails below treeline are almost completely snow-free and it looks more like mid-June than mid-May. I realized it would be possible to do a backpack trip all the way around the Sneffels Range from Ouray to Telluride the long way! 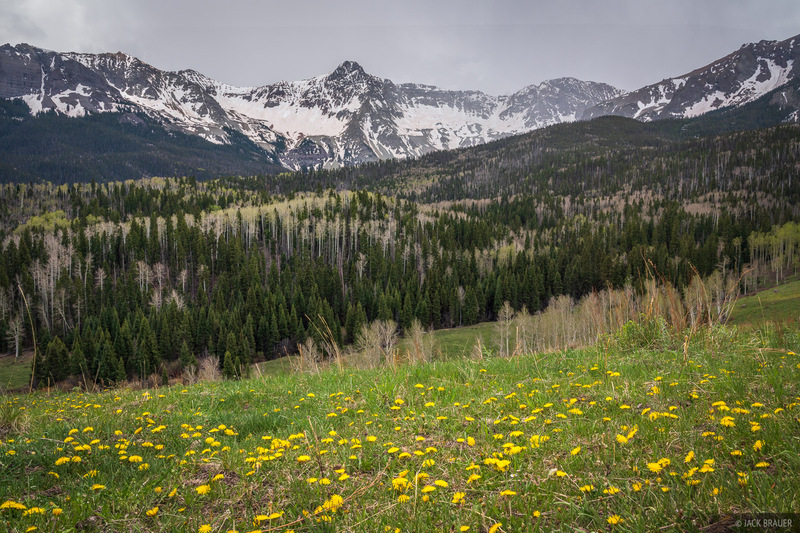 So this last weekend in mid-May I hiked almost 50 miles over three days from Ouray to Telluride, via the Oak Creek Trail, Twin Peaks Trail, Silvershield Trail, Corbett Canyon Trail, Dallas Trail, Alder Creek Trail, Last Dollar Road, and Deep Creek Trail. Below are a few highlight photos from this adventure! Leaving my familiar stomping grounds of Ouray via the Oak Creek Trail, I don't think I fully appreciated the immense journey ahead of me! The first day involved a grueling 15 miles with lots of steep up and downs along faint trails with occasional downed trees to negotiate. After 9.5 hours of hiking I made it all the way from Ouray to the Wilson Creek Trail pass above the Ridgway Hut, where I camped on a ridge nearby the fantastic Sneffels overlook. Sunset on Mount Sneffels (14,150 ft.) above Blaine Basin. Cirque Mountain is visible to the left. My second day of hiking was the longest day - a full 12 hours of hiking to cover 19 miles along the north side of the Sneffels Range to the Last Dollar Pass. This was quite possibly the longest I've ever hiked in one day! 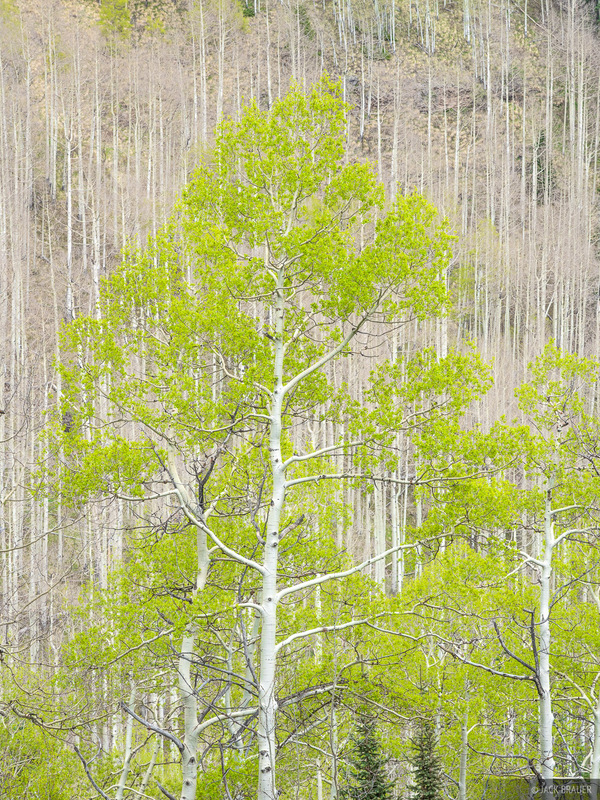 But I enjoyed passing through the many beautiful parks along the way with their budding aspens and dandelion meadows. Mears Peak above Box Factory Park. It's possible to hike or ski along the entire north side of the Sneffels Range via the four backcountry huts of the San Juan Hut system. But on this trip I was just tent camping solo. Wilson Peak (14,016 ft.) veiled by rain showers at sunset - May. The Alder Creek Trail on the northwest side of the Sneffels Range was probably the low point (scenically and mentally) of the trip with 5 miles of drab forest at the end of a whopping 19 mile day. 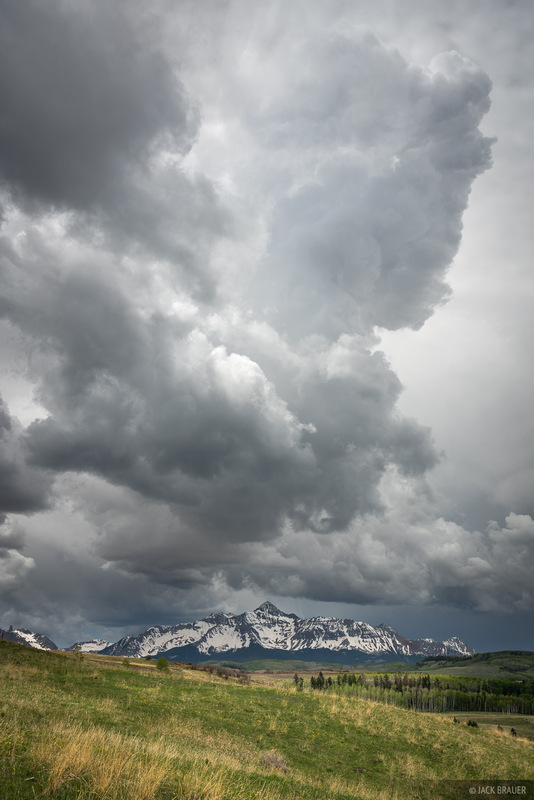 But, upon reaching the Last Dollar Pass road, I was treated to this awesome view of wispy rain clouds passing over Wilson Peak. 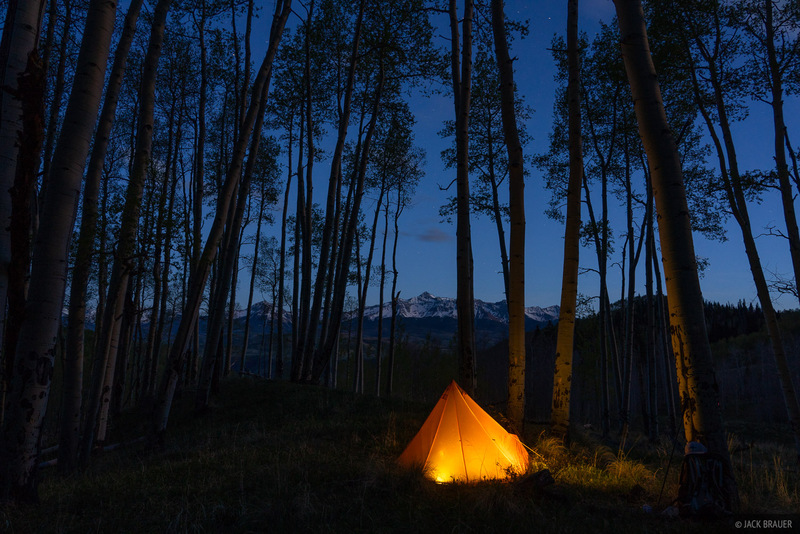 After photographing the sunset light I found a nice campsite in the aspens nearby. 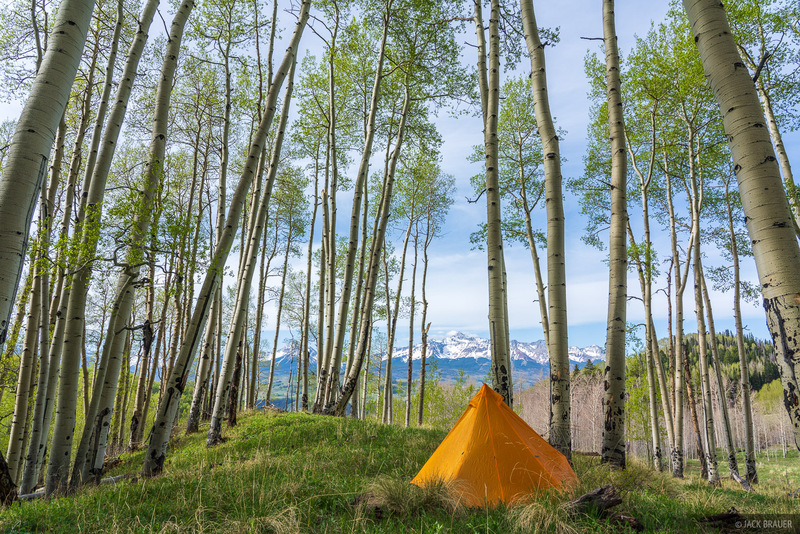 Camping in an aspen grove with a view of Wilson Peak. Camping in an aspen grove with a view of Wilson Peak - May. With clear skies in the morning I didn't even bother to shoot sunrise and slept in until 8:30. 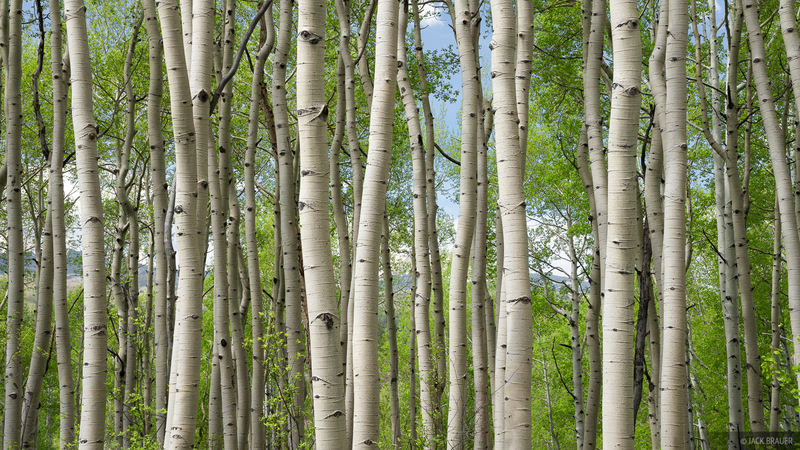 I loved waking up in the aspens with sunlight on the tent and the sounds of birds chirping all around me! 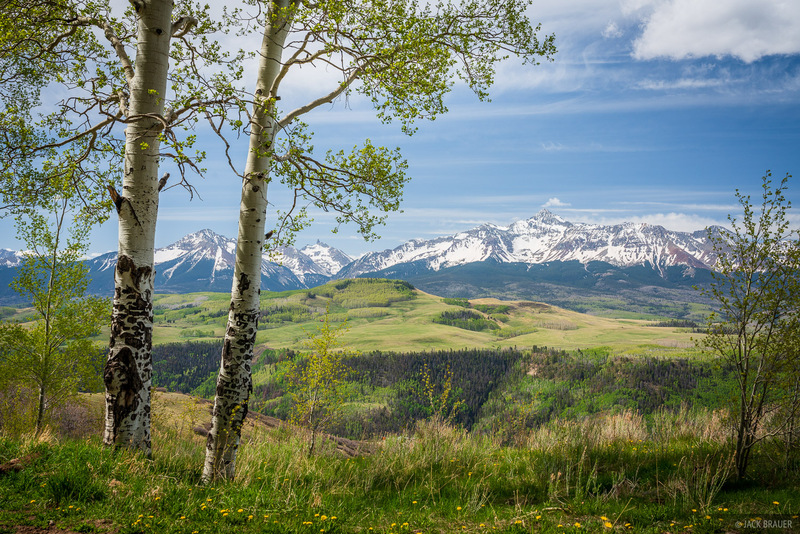 Glorious spring view of Wilson Peak and the San Miguel Mountains as seen from Last Dollar Road. 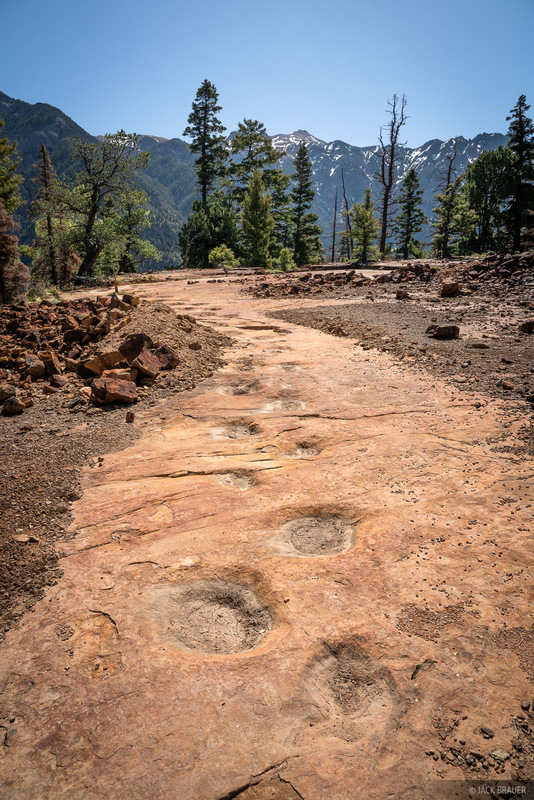 During the morning of the third day I walked along the Last Dollar Road. 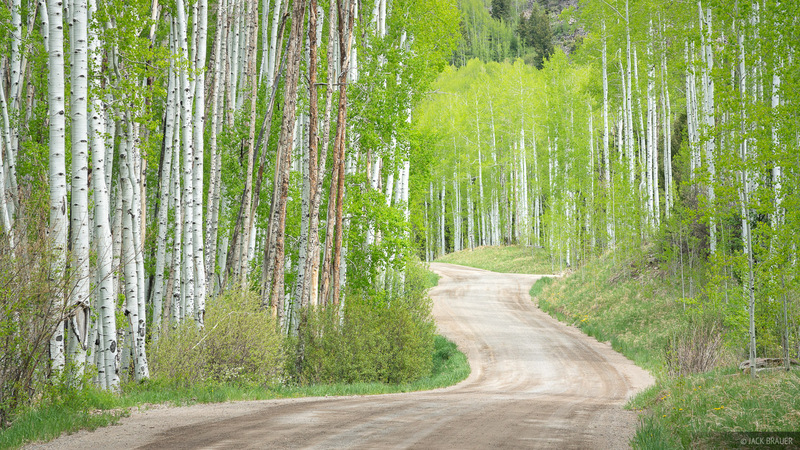 This whole area is a slice of paradise, and while I've driven this road many times it actually makes for a wonderful trail to walk too, with glorious views of Wilson Peak the entire way and lots of mature aspen groves to walk through. Plus it's kind of fun to check out the multi-million dollar dream homes around here! (Lucky dogs). By the time I hit the start of the Deep Creek Trail, massive thunderclouds had ballooned over the San Miguel Range and were headed my way! The weather looked creepy ominous and I was expecting a full-on lightningfest downpour, but fortunately all I got was a bit of hail from time to time. Finally once I caught a glimpse of Telluride, I called Claudia to come pick me up, then hobbled the remainder of the way down to town on my creaky knees and aching feet, concluding another 15 mile day. She even brought me cold beer and homemade cookies, woohoo! 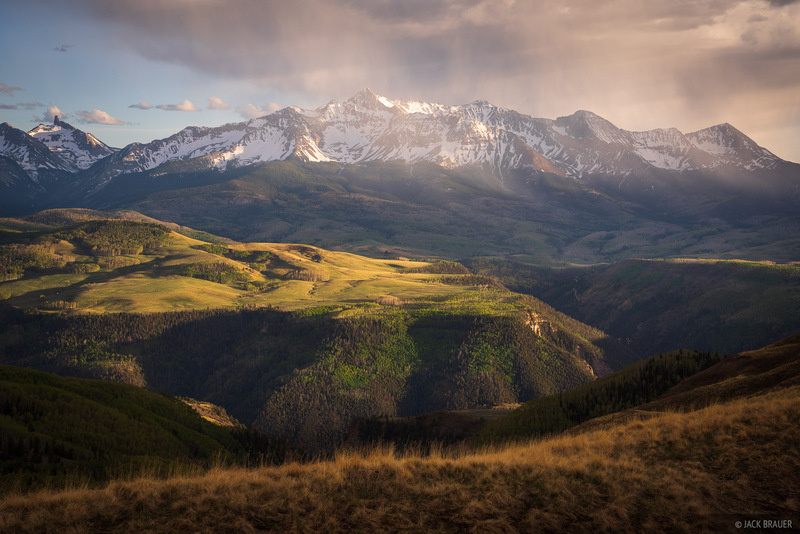 Overlooking the town of Telluride, Colorado. I'm not really a through-hiker type of backpacker, so 50 miles in 3 days was quite excessive for me. In retrospect I really should have stayed out at least three nights instead of two. Nevertheless it was satisfying to actually walk the entire way from Ouray to Telluride around the Sneffels Range and to not only see but feel how it all connects, and to discover some more trails that were new to me. 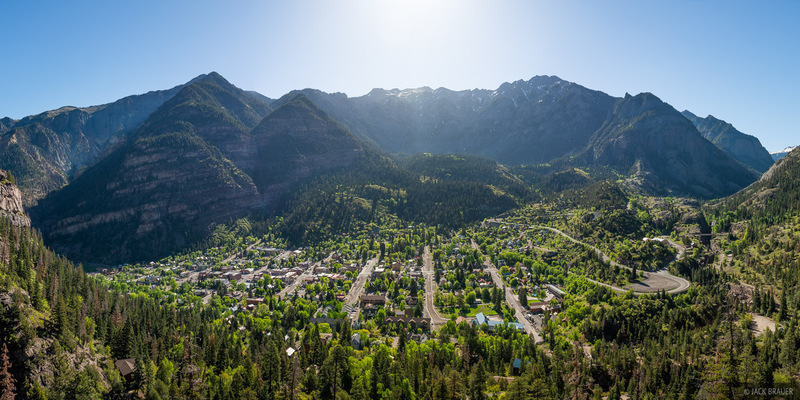 By the way, we recently moved back to Ouray County after our three years away in Crested Butte! We are living in Ridgway now and are super stoked to be back home in the San Juans! This trek was a nice way to get back in touch with my favorite mountains.